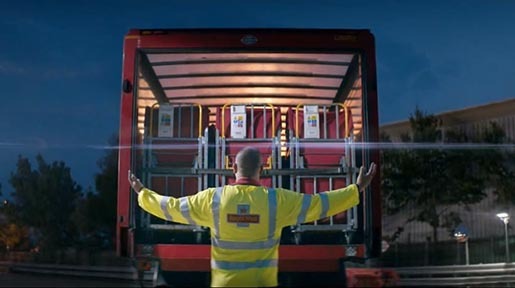 Royal Mail has launched “We love parcels”, a television commercial associated with the build up to Christmas 2013. The advert features the Beatles song, “All You Need Is Love”, recorded by the Royal Mail Choir at Abbey Road Studios. 25 workers were chosen to star in the ad, picked from 2,500 Royal Mail staff from across the UK who applied to be in the advertisement. The campaign focuses on the one billion parcels Royal Mail delivers each year, showing the care and commitment taken to deliver parcels to addresses across the UK no matter the weather, as well as the joy people feel when they receive their parcels. The We Love Parcels campaign was developed at Beta London, by creatives Robert Campbell and Jocelyn Fiske, and agency producer Amy Sherwin. Media planning and buying was by UM London. Filming was shot in London and Northumberland by director Rob Saunders via Amarillo Films with producer Tom Shard, director of photography Justin Brown, art director Ashling Johnson, assistant director Daniel Gibling, and production manager Oliver Goodrum. Editor was Simon Halsall at Simple Pictures. Colourist was Simon Bourne at Framestore.